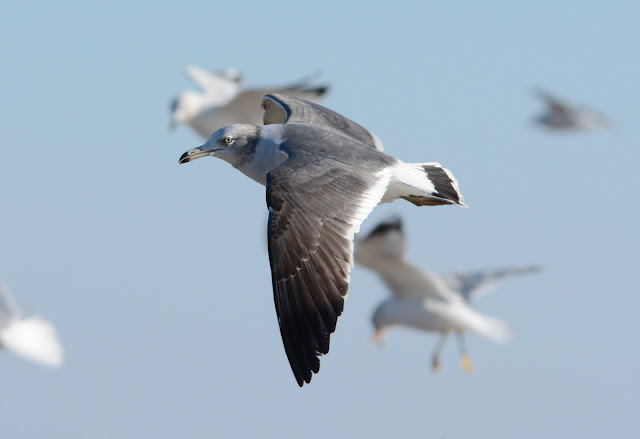 On Monday morning, Bill and Matt Rowe from Missouri found a Black-tailed Gull on the southwest side of Carlyle Lake in Clinton County, Illinois. This only being about 4 hours from my house - in my home state - meant the chase was on. Wes Serafin picked me up at 3:00 am yesterday, and into the blizzard we drove. It was white-knuckle driving with whiteout conditions for about 1/2 of our drive. Cars off in the ditch and at times no sight of the road, made for an uneasy start to the morning. Fortunately, about 45 minutes before we arrived, we got word the gull was relocated above the dam by Mark Seiffert who was gracious enough to stay with the bird. After a little trial and error, Wes and I finally found the spillway and got up to the dam. The views were acceptable - about as acceptable as it is to read in a poorly lit room. You can get it done, but it's not very rewarding and most times you end up falling asleep. BLACK-TAILED GULL (NEAR ADULT). CARLYLE, ILLINOIS. 12 JANUARY 2016. It worked. The bird immediately picked up and began circling in the chum line. It came by at least a dozen times, getting really low and picking up chum. A few times, I had the bird no more than 20 feet from me. The folks above on the dam must have had killer "bird's eye" and eye-level views (as photos would later prove). Evidently, this is now the 18th gull species for Carlyle Lake (the biggest lake in Illinois) and only the 2nd record for Illinois. I'll end with this Eastern perspective: the notion that Slaty-backeds are found with Herrings and Black-taileds are found with Ring-billeds was nicely reinforced here. The Black-tailed Gull is associating with thousands of Ring-billeds (15,000+) that are feeding below the dam on chopped up fish. The last 3 Black-tailed Gulls seen in the Midwest region have been found in the company of Ring-billed Gulls.